Anyone with normal color vision can agree that red is the color of boiled crawfish, cayenne and blood. Yet have you ever made note of something being a certain color, like a dress, or a paint color on the wall, and someone contradicted your reaction stating they see something different? It is quite possible that people see colors differently. Colors can be differentiated by how our brains react to different wavelengths of light and factors such as our mood, emotions and memories. Scientists believe that color perception may not be predetermined; instead of a set pattern, color may also be shaped by senses from the outside world. It is common knowledge that certain colors can affect your mood but not so much as your mood can determine how you see certain colors. In summer months, researchers from the University of York, stated that we may see yellow as vibrant and happy, whereas in the winter season, yellow might be seen with red and brown undertones. Those around you that might seem perfectly pleasant might actually be seeing the world through their own rose-colored glasses. Vibrant colors definitely bring me joy. I dream in color; spring fashion is always the most brilliant; I long for luminous landscapes of tropical places; and vivid bold florals send my mind into a blissful space. I am always distracted and drawn to the paint section at a hardware store; opening a new box of crayons is extremely satisfying; and one of my most favorite visual stimuli is a wall of flamboyant hues at a nail salon. New to the New Orleans nail scene is Paint’d Studio. Manicures have long been a way for those to wear color and test out new shades. Nail polish is a risk-free way to brave an unexpected hue or the pantone color trend of the season without investing in a trendy article of clothing or accessory. However, Paint’d is not your mother’s mani-pedi place. This salon brings “going to get your nails done” into an entirely different league. 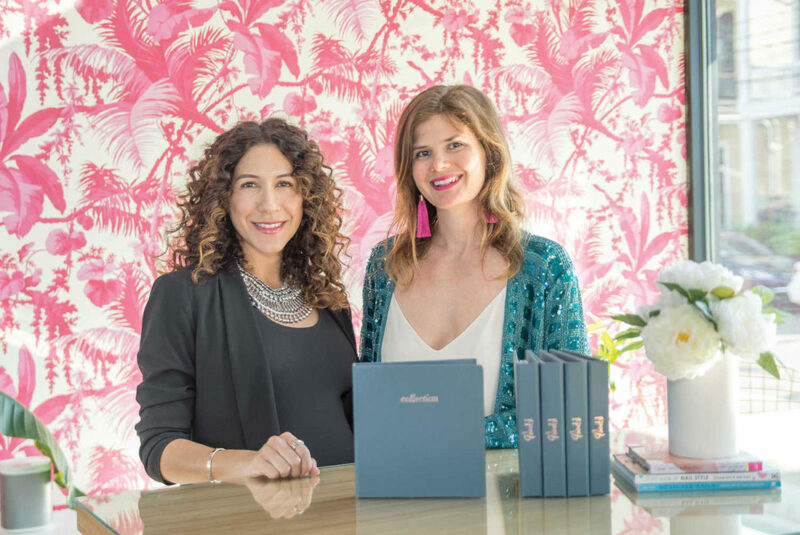 One of Paint ’d’s founders, Aimee Sedky, while living in New York, noticed the nail art trend becoming more prevalent and new boutique manicure studios were popping up in downtown Manhattan. Sedky partnered with Fabiola Divins to open this posh spot a year ago so the people of New Orleans could get their high-style nail fix. Their curated collection and capsules of nail art makes Paint’d a unique concept. The lively music, hot pink palm tree wallpaper and complimentary rosé set the tone for a mesmerizing nail experience. What truly defines Paint’d, and sets Sedky and Divins apart from other salons, is customer service. Each session begins with a design and color consultation. Paint’d is also a “manicures only” salon; they do not offer extensions or acrylics, nor pedicures, and they only work with Deborah Lippmann nail care. Divins stresses nail health. “Many salons will cut cuticles, and this is not good for you,” she says. “Cuticles protect us from having bacteria enter the body through our hands.” Paint’d started a service called The Breather to encourage clients to take a break from polish and get oxygen to the nails. Paint’d also sways clients to try a new design accent and finding the right new is different for everyone. “The individualized consultation process really helps us customize our collection to fit the client’s needs,” Sedky says. A fashion risk differs from person to person; it’s a matter of taste and preference. Choosing your perfect color is all about personality and addressing your skin tone to find a flattering shade. The ladies and staff at Paint’d see color differently too. They want you and your nails to be happy and healthy. No matter the hue or how you perceive colors, Sedky and Divins want you to leave in a blissfully pampered state. No mellow yellow, shy violets or blue Mondays here. Set up your nail consultation, and watch your friends turn green with envy. Color your world beautiful and happy shopping!